From the inspiring to the sweet to the deeply disturbing, some brands just can’t resist making sure every mom has her day. Carhartt –in its first national ad for women -- is saluting the rugged, hardworking moms in a spot voiced by a child who has just learned about Rosie the Riveter in school. 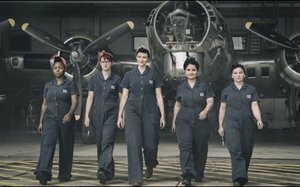 Called “All Hail Mom,” it features real women doing what women do best in their Carhartts, including welding, farming, chasing chickens and building skyscrapers. The ad, which the company created in-house, is scheduled to run on HGTV, DIY and USA Networks, as well as all of Carhartt's social media channels. The runner-up most-like-mom phrases include "I'm not going to ask you again;" "Because I'm the mom;" and "I'm not asking, I'm telling." And behaviors that most make women feel like their mom include crying when kids share happy news, repeating some of her behaviors that once drove you nuts, and calling your own mom more frequently. Probably the least familiar maternal behavior we’ve ever seen? Feeding your adult child Skittles through a grown-up umbilical cord. Called “Umbilical,” it offers an entirely new way to taste the rainbow. We’re betting this one gives you nightmares.